I’m back from my 3-Day journey. Actually, I’ve been back since Sunday night but up to my ears with no time to post a blog. When I finally had a free minute this morning, my Internet decided not to work. First and foremost, this event was truly the experience of a lifetime. I need to thank all of my teammates for making it even more amazing. We walked, laughed and kept eachother going for 3 days. Wherever we went, there was always a member of Ta Ta Breast Cancer nearby. The spirit and enthusiasm was beyond words. As I went through the weekend, I realized more and more why I need to walk until there is no longer a reason to walk. On the last day of the walk, we met Tammy and her husband Wes. Tammy can walk with crutches but just had knee surgery 2 months ago so Wes was pushing her in a wheelchair. Some of my teammates gave Wes a break and pushed Tammy and we had a chance to talk. At 21, Tammy found a lump in her breast. Doctors told her it was nothing and she went on her way. At 24, Tammy sneezed and broke her back. After a few weeks of doctor’s telling her it was a pulled muscle, they finally did an MRI. The MRI showed tumors up and down her back. She started chemo when she was already engaged to Wes. Six months later, they got married and Tammy danced at her wedding completely bald. 3 years later, Tammy has a full head of hair and takes an oral chemo to keep her stable. It is through the advancement of research and treatments that Tammy is still alive and more importantly enjoying life. On a similar note, I spoke to a young woman yesterday on the phone who works for the breast cancer 3-day. She’s 24 and was diagnosed at 21 with breast cancer. By the time, she was diagnosed it had traveled to her liver. She has her chemo “cocktail” every 3 weeks to keep her stable. She said all of this with a smile in her voice, told me that the breast cancer 3-day is so important because it continues to fund research that discovers drugs that will keep her alive. She also told me that she is doing great. When 1 drug stops working, they’ll find another. She is walking in two walks and is the coordinator of another one. And people say I’m an inspiration. These two woman are beyond amazing and just gave me more fuel to my already flaming fire! On Saturday night, I had the pleasure of speaking to the 3,000 plus men and women. I shared my story and hopefully conveyed my passion for the cause. We need to be advocates for our health. We have to know that when it comes to a breast lump, we need to take action even if it seems to be nothing. I said these words at the Relay for Life and once again at the 3-Day. Beyond all of this, the event was a ton of fun. One team member described it as euphoric. We laughed through 60 miles (and cried a few times too). We laughed at night and bonded with our teammates. We formed new friendships and made existing friendships stronger. We experienced a life-changing event and did it together. It was a sea of pink and applause everywhere we turned. At closing ceremonies, I walked in next to Suzanne (an amazing woman who had breast cancer 6 months before me and shared her hats and her wisdom) and Pam (an amazing woman diagnosed 6 months after me whose smile could light up a room). On another note, in case you missed my 5 seconds of fame on Saturday, the Detroit Free Press included a quote from me. On Sunday, they ran a story about my friend Pam. 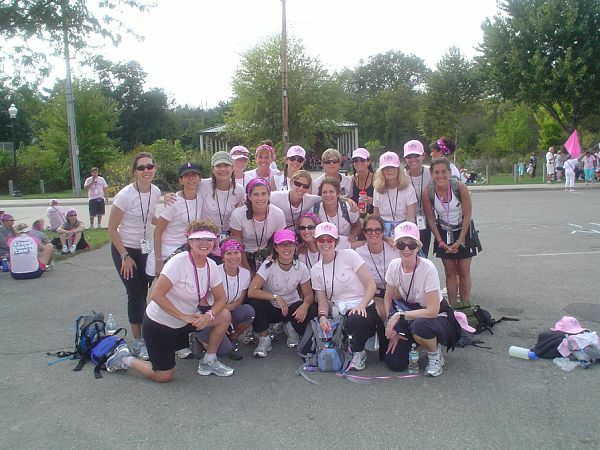 I hope many of you will consider joining me in the 2009 breast cancer 3-day and experience what I had the pleasure of experiencing this past weekend! Posted on September 30, 2008, in Uncategorized. Bookmark the permalink. 3 Comments. So glad I dropped by your blog today. Your words have encouraged me as I continue to train for the Breast Cancer 3-Day in Dallas, Texas this November! I can’t wait to walk amongst the sea of pink! I had the best time walking 60 miles and cannot wait to join you again next year Ellyn.